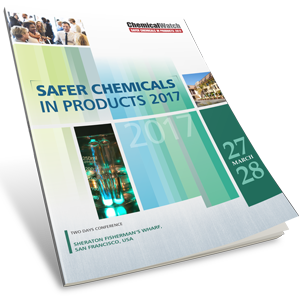 This annual event from Chemical Watch, offers an up-to-the-minute view on achieving safer chemicals in products. Drawing on examples of best practices and the lessons learned from existing approaches (including those from both TSCA and state level) this event looks at the interplay between regulation and safer chemicals, together with the business benefits of progressive safe chemicals management through the supply chain. The program features a review of the latest work being done on the assessment of alternatives to high-risk chemicals, highlighting the current thinking on substitution and alternatives assessment from the US and Europe. The conference will end with case studies from downstream industry sectors including textiles, retail, electronics, healthcare and cleaning products. Our panel will discuss how approaches to alternatives assessment are being used to address chemical safety issues in supply chains. It will address how companies are working to reduce or eliminate the use of hazardous substances in their products to ensure best practice and minimise liabilities and the chance of business disruption. 1:15 TSCA reform: What is it? 2:05 TSCA Reform: Challenges, opportunities and innovation. It’s not easy to obtain information on the chemical ingredients of many products, and the potential hazards they present. It is common for midstream and downstream users to struggle to obtain the critical information they need to assess and manage risks as information can be unavailable, unclear, or lost in the supply chain. In this session, speakers will talk about the different chemical information needs, and how to overcome the challenges faced in obtaining that information. 4:30 Inventing Green Chemistry Products at the Warner Babcock Institute for Green Chemistry. Save 20% on this year’s Biocides USA, which takes place directly after Safer Chemicals in Products, at the same venue, on 29-30 March. Maximise value for you and your colleagues when attending both events yourself, or when you recommend a colleague. Just email glen.marechal@chemicalwatch.com or call +44 (0)1743 818293 to find out more and secure your discount. Chemical Watch is inviting appropriate sponsors to exhibit at this event and, in doing so, to benefit from a complete promotional package in the lead up to the live event itself. Click the button below to contact one of our sales team who will be happy to provide you with more details.